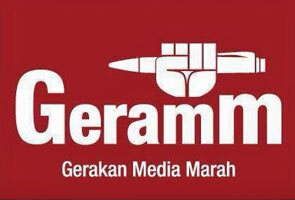 KUALA LUMPUR: City police have confirmed that police personnel will be stationed at the Bar Council on Jalan Lebuh Pasar tomorrow to monitor a protest organised by an ad hoc group of journalists called Gerakan Media Marah (Geramm), according to a report by The Sun Daily. Deputy police chief Datuk Amar Singh: "Yes, we are aware of it (the protest) and we will be there." When asked if the group had informed them as required under the Peaceful Assembly Act (PPA) 2012, he said: "No, we were not notified, but we are aware of it being held at the council." In its report, The Sun reported that the group had on Tuesday issued a statement through its Facebook page that its "Red Pencil" protest will be held tomorrow at 2pm. When contacted, the group's spokesman Radzi Razak said the protest is expected to last for about an hour and that the police had been notified of the event. The group, in a forum held December 29 last year, issued eight demands to the government and related parties with regards to press freedom in the country. Among the demands include the abolishment of publication permit and the revocation of the suspension on a weekly magazine `The Heat'. On Dec 18 last year, the Home Ministry suspended the printing permit of the weekly publication as it had allegedly failed to provide an "official response" to two ministry's show-cause letters, which was vehemently denied by the publication on Dec 24. In its statement, the ministry said that The Heat was originally approved on July 8 as a weekly publication under the “Economic/Social" category. It then applied to change its scope to “Current Affairs” which approval was given on Sept 18. The publication has since clarified on its portal that they have extended their full cooperation during the meeting with the ministry's officials to resolve the issue. The outcome of the meeting has yet to be publicised. Meanwhile, the Coalition of Free and Fair Elections or Bersih 2.0 said it is appalled with the federal government for starting the New Year 2014 on the wrong foot with continued suspension of the publication. The non-governmental organisation (NGO) has declared its support of the calls by other NGOs, like Geramm, in urging the government to immediately lift the suspension.